Comfortable second floor condo with elevator. Large deck looking out on water. We loved the warm swimming pool that was perfect for cooler February nights. We taxied into town then walked home from historic cemetery. Walking into town is doable if you’re able. Great place for two couples. Highly recommend. We have visited Pelican Landing numerous times in the last 17 years. Always enjoy the space, location, pool, etc. Thanks for having us!! Pretty much everything we needed. Great facility, staff and location. 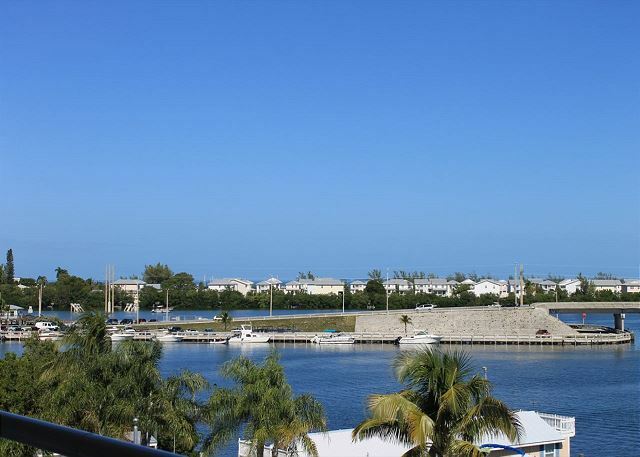 Excellent location (a short golf cart ride to downtown Key West, ample and clean apartment. Very caring treatment from the management. I (a Tallahassee man) hosted my Pittsburgh daughter, son-in-law, and 3 young grandsons at Pelican Landing. It had fierce competition, since I usually use my retired Navy status to host guests at Trumbo. We had a fantastic stay at Pelican. Loved our quarters, the pool, the fish cleaning table, the tarpon, nurse sharks, mangrove snapper, and much more. We were also very well treated by staff. I hope this will not be our last stay there. Thanks to all for taking such good care of us. The condo was perfect in size and very comfortable. It was sad to see there was still some damage from last years hurricane, but that didn't interfere with our fun trip. We will definitely stay here again when we go back to the Keys. Nice apartment needing some updates. We had a wonderful time at this apartment for a girls weekend. 4 of us had plenty of room. Needs some updating as furniture is showing wear and tear. Porch/balcony definitely needed floor repair as there is a big tea approximately2 feet where someone could get caught in and fall. Stairs to pool were a tight spiral.... Definitely wouldn't do with a buzz! Pool area extremely nice. Floors were extremely dirty. If barefoot feet would be black. Overall though it is a nice location with great vow of the fishing harbor. Far enough to get away from the hustle bustle of Duval St.
We had a wonderful trip to Key West. Our unit was clean, comfortable and well appointed. We enjoyed the pool and the view of the harbor from our back deck. The exterior of the building was a bit dirty and showed some wear, but as I said the unit was clean and in good condition. We he hot water tank was small, it worked fine but we had to stagger our showers. We would stay again. We chose to stay at Pelican Landing because they have their own small marina and we were able to park our boat there for no extra charge. We usually always stay in one of the older bed and breakfast hotels in Old Town, but since Pelican Landing is located in Garrison Bight and we had our boat this time, it was very easy to get gas on our way out to explore the waters around KW. We also brought our bikes and the bike ride from the condo to the Schooner Wharf area was less than 10 minutes (and we bike very slow). With it being located out near Roosevelt (the main road when you come in from Stock Island), it was also very easy to run get groceries, liquor and beer whenever we needed it. As far as the accommodation itself, it is an older condo, but was very clean and roomy and our huge balcony overlooked the harbor. Our furniture had all been updated, so it wasn't like it was severely outdated, but like with most older condos in FL, the ceilings are really low and the tile and bathrooms are pretty outdated. However, like I said, they were very clean and it really didn't matter because you won't be in your condo much anyway. As far as the rest of the facility, it was great because there is a bike rack in the garage for your bikes, an elevator with carts for your luggage/groceries, another cart available to load your boat with your supplies, a fish cleaning station, bathrooms downstairs by the marina,the City marina is across the way to leave your boat trailer, water hoses in case you need to hose down your motor, a swimming pool, lots of seating and chairs to lay out, and it is located next door to one of our fave pubs in KW, Mellow Ventures. The set up could not have been more convenient. Very nice view. Rooms are clean and roomy. Location is convenient. It's not in Old town but close enough for biking there. The only problem is the toilet. Water level is set too low, so flushing is too weak. You really will have to flush multiple times if you don't want to end up with a clog toilet. It's kind of defeat the purpose of saving water. I hate all green technology, so my review is already biased. The only true way to save the environment is don't waste and reuse whenever possible, not green technology that makes it inconvenient for the consumers. 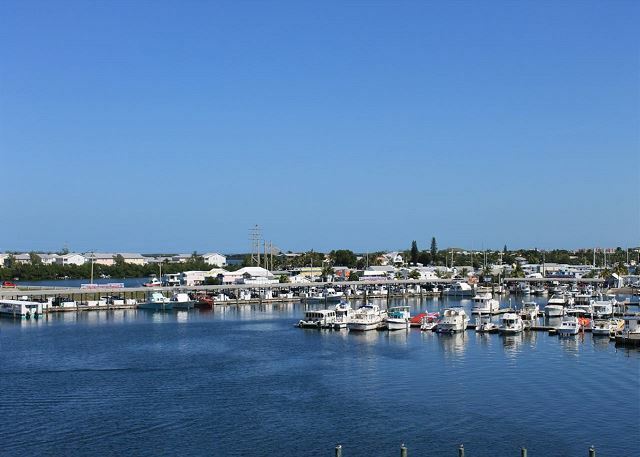 Pelican Landing offers amenities for boating and fishing! We loved the convenience of having everything right there as well as having our boat parked in front of our condo! The staff were attentive and helpful! The condo was clean and fully equipped! We will be back! 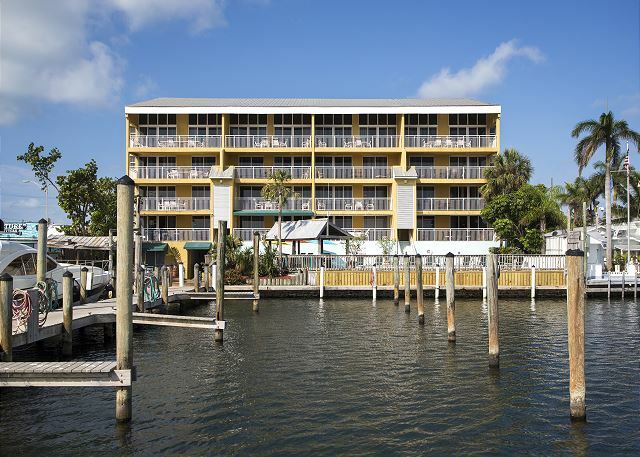 Located on Garrison Bight w/ beautiful Harbor views we have come back to Pelican Landing 3 years in a row. The condo was lovely, large, perfect for our family. The view from the deck was beautiful....sunrises right from our deck. The pool area was so clean and fun! Loved that we could access the pool right from our deck. Definitely within walking distance to Duval St. and all the fun! Two of my friends and I rented Pelican Landing for 5 days. 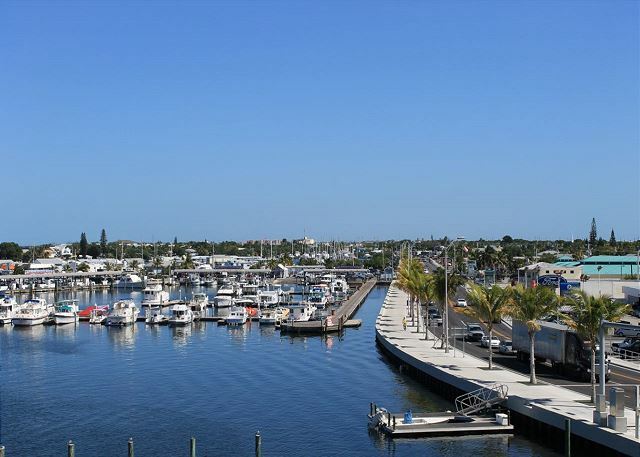 It's a beautiful space with a huge living room and a great balcony overlooking the marina. Mellow Cafe downstairs has excellent tacos and Duval street is about a mile away. The apartment has 2 bedrooms and we used both but it does look like one of the bedrooms is rented separately. It has it's own entrance to the hallway. Overall, I'd highly recommend this rental. Condo is huge! perfect for what we needed, though the elevators are extremely slow moving. Also, there was a leak in the pipes in the unit above us and it leaked into one of the bathrooms. It took two days for this to be fixed and cleaned up. Also, when we used the grills one caught fire as soon as it was turned on from all of the "gunk" built up in it. After a few minutes it burnt down and was fine to use but someone called the fire department and we were threatened to be evicted due to no fault of our own. The Pelican Landing was s perfect fit for us. The unit was well equipped with everything we could have needed. The pool area was nice and clean. The view was great and the location was close enough to all the action without all the noise that comes with it. The employees were great as well. I would definitely stay here again. We stay here because of the boat slips in the back, they have a pool and it's relatively close to anything on the island especially if you have scooters. We travel with a large group, rent 4 rooms each year, its a great place to stay. Second time at this property and enjoyed ourselves again. 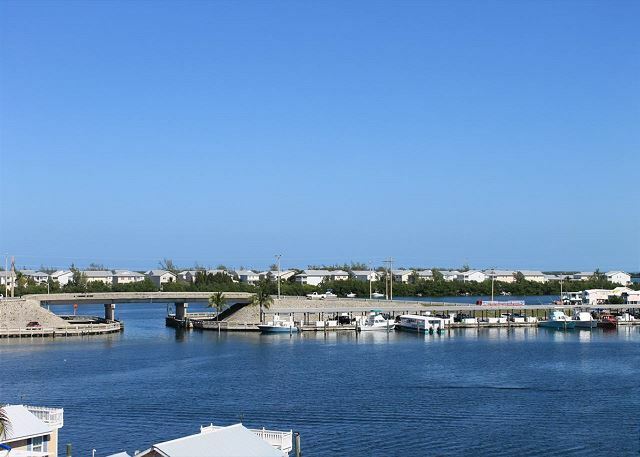 The property is well equipped clean and has a great balcony overlooking the marina. Alexandria was fantastic throughout the booking stage and at check in making arrival effortless. It is approx a 25 min walk to Duval along Truman but there are taxi's, bikes or mopeds to hire if you wish to make the journey easier, especially after a long night partying???? We are ''Snowbirds' and consider ourselves fortunate to have found Pelican Landing for the winter season. Wonderful experience. Accommodations superior. Have compared other rental and Pelican Landing is far ahead. Staff extremely friendly, knowledgeable, helpful in all matters. Property kept clean and manicured. Look forward to returning again and again. This was a perfect condo for our family. We had two teenage boys so having separate beds was great. The place was clean and kept nice. The balcony was our favorite spot and even saw a manatee from the view! It was very nice. We would stay at this location again. Just as Advertised...great value and location. 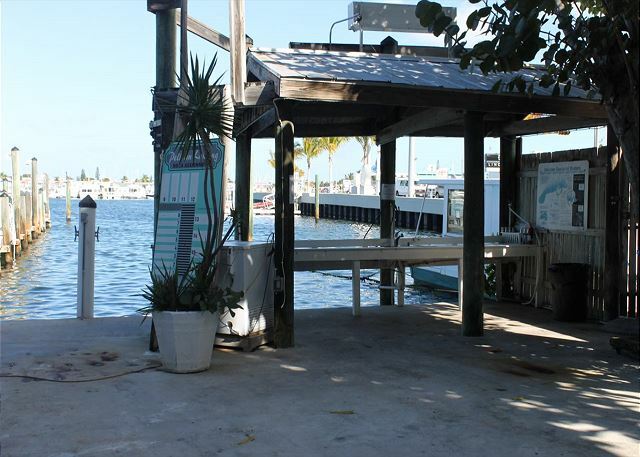 Great option for Key West lodging. Felt like a private resort as we had the entire place to ourselves, basically. The pool was great and we used the grills to cook some lobsters. We loved the spacious accomodations and the furniture was extremely comfortable. We had everything we needed in the unit and it was very clean. We did experience some sugar ants in our unit, but the management responded quickly and took care of it. We will definitely stay here again when visiting KW in the future. Great water views and very quiet place. Such a better value than a hotel - and much cheaper too. Our group really enjoyed this condo. Having access to our boat right on the dock with a fish cleaning station, ice and a great pool was exactly what we needed! Great place for family vacations. The condos were clean and spacious. With kids, it was great to wake up, have coffee and make breakfast in our unit. Overall a very nice stay. We will be back! I Honestly Was Not Very Sure How The Property Would Turn Out Because ThePhotos Weren't That Great, But It Turned Out To be A Very Nice Condo. I Would Recommended It And Plan On Staying Next Year. Great condo. 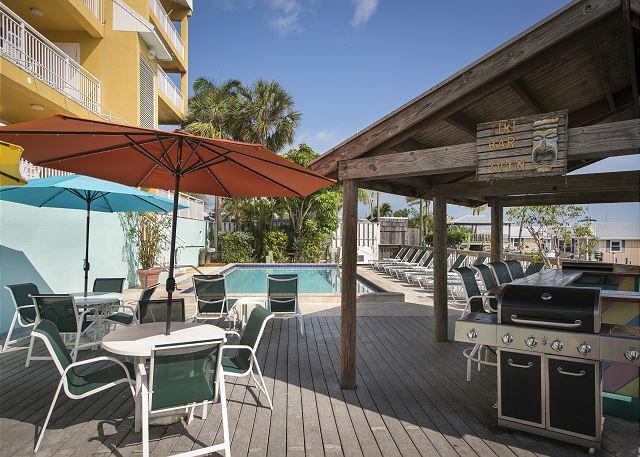 All the necessities - large, nice balcony with view of harbor, kitchen, washer/dryer, away but walking distance to the tourist area in Key West. Perfect for our needs. I found the folks managing the property the best I have ever seen. I have been leasing property for 20 years there and these folks are properly trained, professional and caring. Always helpful and in a timely way. We have been staying at Pelican Landing for the past twelve years and we haven't been disappointed yet. It is so convenient having our boat right there with us. We hope to continue our yearly visits if all goes well. 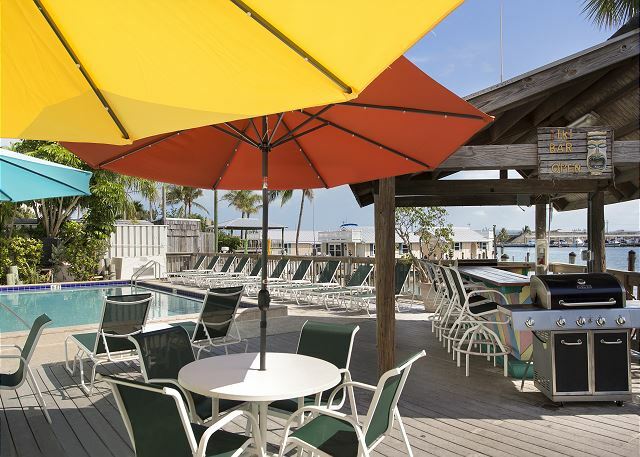 It's a nice affordable place to stay in Key West. The rental unit was fine - the living area was spacious and we loved that we had a palm tree right outide our balcony. We could not walk barefoot even though the floors looked clean because it does state that diesel fuel from the boats leave a film if you keep the patio doors open, and some people's feet were black - but we were warned about that in the manual. The the amenities were great, plenty of utensils, glassware, dishes. The staff and service was excellent. We asked for daily towel service and we got it. The pool area was wonderful and we loved that we had direct and secure access from our balcony (2nd floor) to the pool. Definitely was worth the price. Thank you very much! This was our second year in the same unit and we have rented again for next year. Repeat customers, very accomodating management. We have recommended Pelican Landing to a number of our friends who will also be repeat renters. The unit was what I expected. A pleasant view, quiet, and close to public transportation. The SCUBA dive company around the corner was disappointing; I do not recommend them. We secured the condo for a last minute holiday weekend with our 4 teenagers. The condo was spacious, clean & comfortable. Would chose again for a family trip. Loud pool party erupted at 4am waking our entire party, loud cell phone talker outside the front doorway...property was very nice but the lack of enforcement and one loud group likely ruined the stay for all the other rooms (in the daytime there was a large group in the pool with ~300 empty bud light cans, making the pool essentially off limits for other guests). Management was very helpful when onsite and took care of us I just wish they had someone on property at night to enforce the rules a bit, when I called the after hours hotline someone came to the property within 15 minutes and shut down the pool party so I was happy with that. Yes you can stay in the "quaint" Key West bednbreakfasts and have that unique experience... BUT when you are traveling with two families this can be hugely expensive involving renting several hotel rooms at 200 a night! 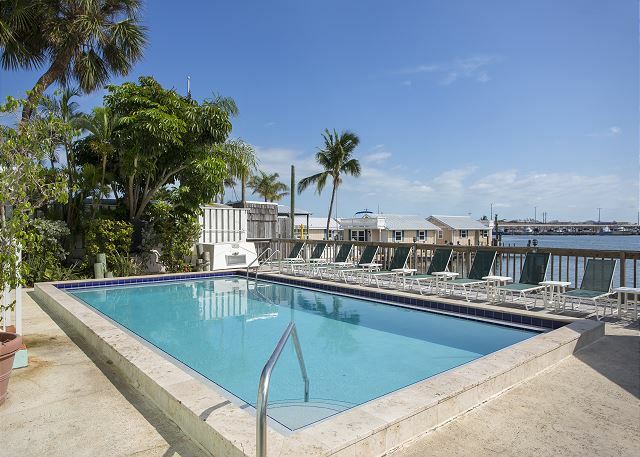 Pelican Landing is the ideal location with it's 2bed/2bath condominiums with a full kitchen, and even a pool with barbecue looking out over a picturesque marina bay! Two steps to the supermarket and you can save a bunch of money on meals... Of course you do have to savour some of KW's fine restaurants, but this way you dont have to pay restaurant prices 24/7..
We have stayed in the South end of town as well, and PL is just as conveniently located to all the action without having it in your ear at night.. Thanks for the great time, excellent facility for a great price. Good location, short drive to all the action. The staff was helpful. However, housekeeping/maintenance can do a better job, despite the rental looking fairly clean...we found a few bugs in our rental the first night in the bedroom. However, if management takes care of this I would 100% recommend this property.